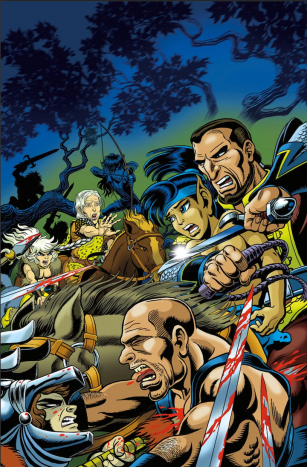 Dark Horse Comics has released the cover and issue synopsis for Final Quest issue 23. Things are heating up in the Holt! SPOILER ALERT. The issue is out December 27 in comics shops, from TFAW and digitally on Dark Horse Digital and Comixology. So we’re indeed coming to the end of The Quest, are we? And a most explosive end it will be, I think. Yes, ’twill be sad for those of us who have ridden with the Wolfriders, the Go-Backs and our favorite elves and Trolls, but alas, all good things must have their end. And really, as long as Cutter, Leetah, Skywise, the Wolfriders and The Quest live on in the hearts us, their loyal fans and human packmates, it will never, ever TRULY end. Shade and Sweetwater, and may we say with the Wolfriders……….